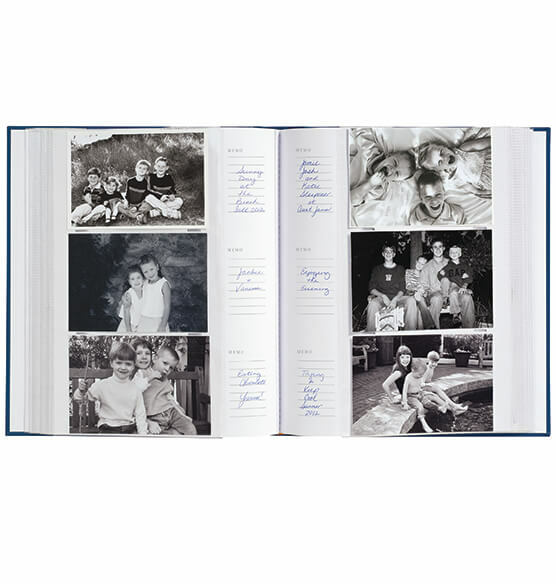 Have fun creating photo albums filled with fond memories with our Felicity large memo photo album featuring 50 quality book bound pages. This expanded size is perfect for preserving horizontal 4" x 6" photos and two photos fit on a single side. And, because this is a memo album, you can jot down all those little details that make each photo unique and special. 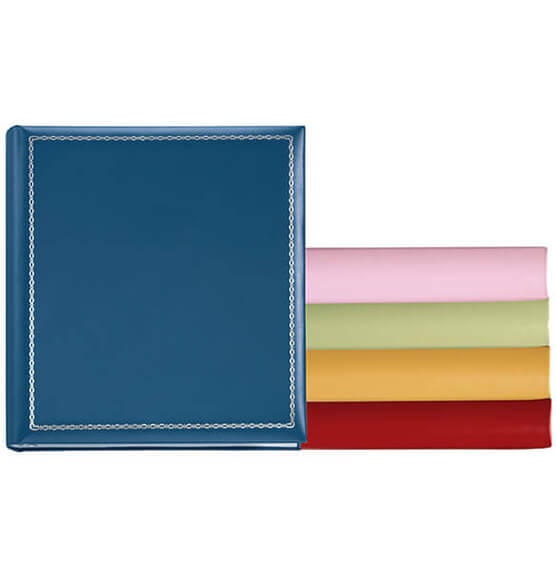 Wrapped European bonded leather cover design includes distinctive silver tooled borders. 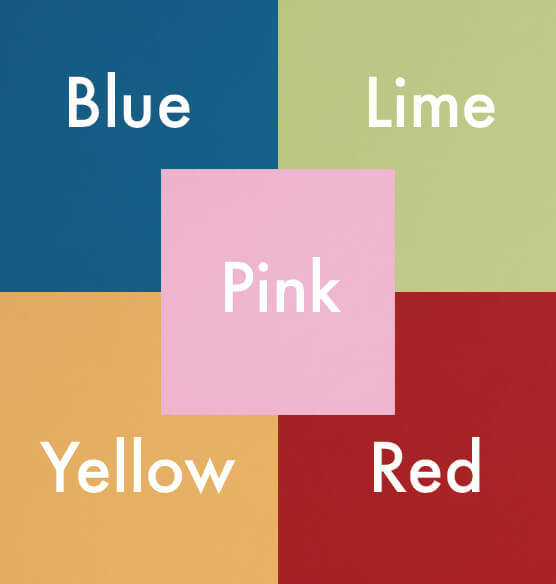 Choose an array of upbeat, contemporary colors. I love this album! It is perfect for documenting my new baby in both photographic images and in the written statements. Love the quality and the hardness of the cover. This album is beautiful and elegant. It is of very high quality (as expected from Exposures!). I plan on purchasing more in the future in different colors. Good memo albums are hard to come by so I am definitely ordering more of this one! I am using this as a family album. The memo feature lets us make note of who and what is in the photos. A well made product. I would buy tons more, if they went on SALE !!!!!! Good quality of the album. Wish numbers to identify year & month of the album were provided how it was in a past. 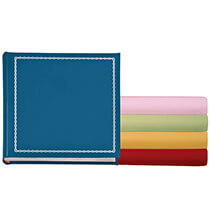 The binding of these albums is very weak and does not hold up to a full set of pictures and the turning of pages. It may not fail until the album is full and then your only choice is to re-write all the memos in another album. I used these in the past and they are very well made. Great album -- easy to insert pictures and jot down a thought about the day or event. Love the different colors! good reviews, have had luck with exposures several years back. nice savings today on Cyber Monday too! The albums are excellent, sturdy and I love the space to write descriptions! I have been in the process of making a photo collection for each of my four children. It is a hobby I have been doing for many years now. These albumns are perfect because they are very nice quality and each page allows me to write a little something about each photo as well as the date. Photos on the computer cannot compare to viewing them nicely organized by date in beautiful albumns. There is just something special about viewing them after the photo is printed. Liked the colors and format of album. Already have one. Love it. I love all the color choices! For my other son's birthday photos, year after year. I purchased this because I was looking for a similar item that I had purchased 15 yrs. ago from Exposures that I was happy with. I chose this album only because I have seven others for my daughter and I wanted to continue the set. However, I wish that I wasn't already invested in the set. The spines are weak and do not hold up to a full set of pictures and the turning of pages. If I want to move those pictures to a new album, I have to re-write all the memos. The plastic sleeves do not always stay in place as well. I would definitely not recommend these albums. I bought the red memo album. I will use it to make a Christmas album through the years as my kids grow up. I thought these would be the quality I had purchased in the past, however the spine on two of them began to come apart with only 10 pages of photos inserted. All were returned. The color and ability to write down info on the photo. In catalogue & I always choose your brand. Ordered them before and love them! We're able to write a note with pictures! The reviews were helpful in determining the quality of the photo album I selected. This album looks like it will be perfect to get my photos out of boxes and more easily enjoyed by my family. I have shopped your web site for years and love your products. For my son's birthday photos, year after year. BEST ANSWER: Thank you for your question. Our pages are archival quality pages and do not contain any chemicals that cause bleaching in pictures. We hope this information will be of help to you. Hallo, do you have also other collors? As on the picture - sky-blue? BEST ANSWER: Thank you for your question. Unfortunately no, any colors not listed have been discontinued. We hope this information will be of help to you. BEST ANSWER: Thank you for your question. The pages contain 3 horizontal 4" by 6" photos per side and contain columns were you can write details for each photo. We hope this information will be of help to you. Can this album be I engraved? BEST ANSWER: Thank you for your question. To have the Felicity Large memo album personalized you will need to purchase item 301618, as this item 344123 can not. We hope this information will be of help to you. Can this album be personalized? I don't see a menu item for personalization of this album...Can this album be personalized? BEST ANSWER: Thank you for your question. We have included the link to the Felicity Large Memo album, item 301618, that can be personalized.We hope this information will be of help to you. BEST ANSWER: Thank you for your question. The green is going to be a darker green. We hope this information will be of help to you. Looking at the photo, the green appears to be a dark green. I bought lime, which is a pale green. The green that I got is a soft sage green. Hope this helps. Do you have an option that is more like a scrapbook (no rings) but includes blank space for memo at the bottom of each page rather than ruled columns? 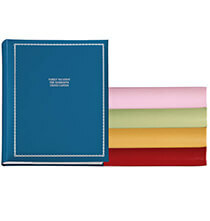 is the large size album a 3 or 4 ring binder? BEST ANSWER: Thank you for your question. 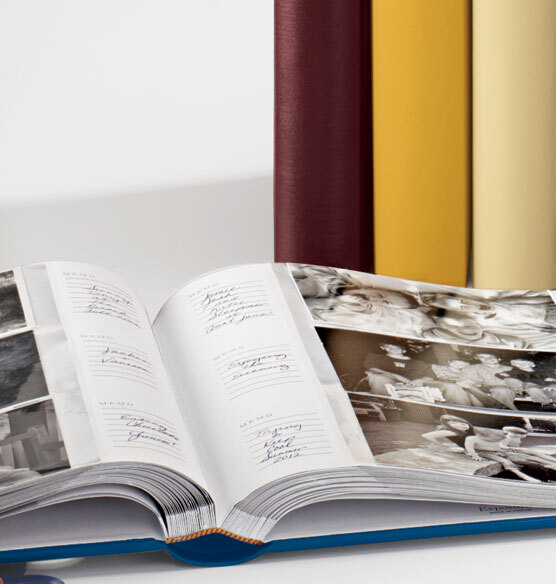 The Felicity Large Memo Photo Album is a book bound album, no rings. Does the large Felicity Album come in black? BEST ANSWER: Thank you for your question. Unfortunately the black albums have sold out. Since we no longer have inventory and are not expecting further shipments from the supplier the item was cancelled. We apologize for any inconvenience this has caused you. We hope this information will be of help to you. why is this no longer offered in light pink? BEST ANSWER: Thank you for your question. Unfortunately the pink color is no longer available. We will not be getting the pink color back in stock. We hope this information will be of help to you. how many ;photos does this album hold? BEST ANSWER: It really depends on how many photo pages you put in the album. It will comfortably hold at least 30 pages. It also depends on the size of photo you are putting on your pages.